As Mexican authorities continue to deal with two separate migrant caravans on both sides of their southern border, a third began its journey from El Salvador on Wednesday. While the first two migrant caravans began in Honduras, the third started north from the capital of El Salvador, Reuters reported. The group is believed to be made up of about 2,000 individuals including men, women, and children. The third caravan comes at a time of escalating tensions where the two previous groups clashed with Mexican police forces at the border with Guatemala. The clashes led to Mexico’s warning about the deployment and further potential use of Molotov cocktails against federal police forces guarding the Mexican border, Breitbart News reported. Human rights groups and journalists also called out the Mexican government for its use of a helicopter to push back migrants that tried to wade across the Suchiate River border into Mexico. This week, authorities arrested two Honduran men after they allegedly shot at Mexican federal police officers guarding the caravan. Mexico City unveiled a program to provide temporary employment, education, and healthcare to those who would agree to stay in the southern region and follow proper procedure to seek asylum. Immigration officials reported that only 111 of the migrants accepted the offer while leaders of the first and northernmost caravan publicly declined. 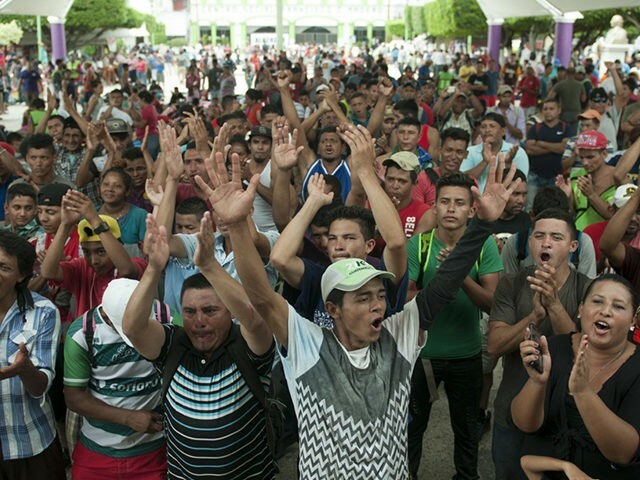 The first two caravans became an international political issue as President Donald Trump stated that he would cut foreign aid to Central America if the caravans were not stopped. The U.S. is deploying more than 5,000 troops to the U.S.-Mexico Border states in preparation for the eventual arrival of the caravans.